The universities of Ireland, North and South, today conferred an honorary Doctorate of Laws (LLD) on Charles F. “Chuck” Feeney, founder of The Atlantic Philanthropies. 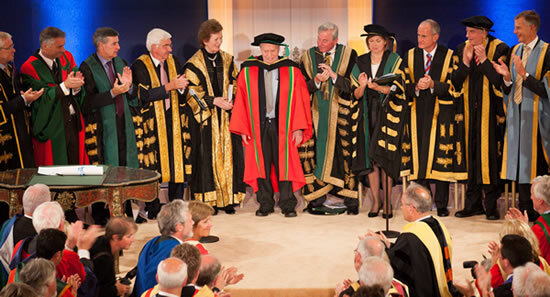 The degree was conferred to give public honour and thanks to Chuck Feeney for his incredible support of the Irish universities over the past twenty years. It was also conferred to convey to the people of Ireland just how radical and transformative this continued support has been. This is the first time that the universities on the island of Ireland have come together to confer their highest award on an individual. Since 1989, The Atlantic Philanthropies have donated almost €800 million to Irish universities, North and South. Introducing Mr Feeney, Dr Patrick Fottrell, Chair, Science Foundation Ireland, said that ‘Chuck strongly advocated a “think big”, ambitious approach to third level research funding. He wanted to transform rather that “tinker at the edges” with the Irish research landscape’. ‘Thus, the Programme for Research in Third Level Institutions (PRTLI) was launched in 1998 by the Higher Education Authority …. Atlantic funded 50% of the first cycle which was vital to kickstart the Programme. Levels of funding in the 100s of million euro which had been available in other competitive countries for many years, now became available in Ireland for the first time. Five cycles of the Programme have now been completed with an investment of 1.22 billion euro which includes government and private matching funds. The programme has provided key physical facilities and personnel for research in the humanities, sciences, engineering, technology and the social sciences including business and law’. Outlining Chuck Feeney’s contribution to the universities of Northern Ireland, Dr Fottrell referred to the joint initiative developed between the Department of Employment and Learning and Atlantic Philanthropies called The Support Programme for University Research (SPUR). The aim of this Programme was to support and strengthen the research capacity of both universities enabling them to increase the number of Research Centres capable of being assessed as being of the highest world quality in the Research Assessment Exercise which is a periodic assessment by the UK Government of the quality of research in third level institutions’. Dr Fottrell emphasised the impact the additional resources provided by Atlantic have had on raising the status of Irish research internationally. ‘For example’, he said, ‘independent ratings agencies now rank the quality of research in both Northern Ireland and Republic of Ireland in the top 20 in the world. About ten years ago the Republic of Ireland was 40th in the world. Also, in strategically important areas of food and life science, rankings as high as the top three in the world have been attained. These are remarkable achievements’. Dr Fottrell also acknowledged the support of the Irish Government for continued commitment to research funding ‘especially in our recent difficult economic times’. He recognised the roles of the Higher Education Authority and the Departments of Education and Skills as well as Jobs, Enterprise and Innovation. Dublin, University of Dublin; University College Cork; University College Dublin; University of Limerick; University of Ulster. Dr Mary Robinson, Chancellor, University of Dublin. The Taoiseach Mr Enda Kenny TD and the Minister for Education & Skills Mr Ruairí Quinn TD were guests of honour at the ceremony.